McCaskill was the first elected woman to represent Missouri in the U.S. Senate. Jean Carnahan was appointed to the Senate following her husband's death and posthumous election, but was defeated in a close election by Jim Talent. 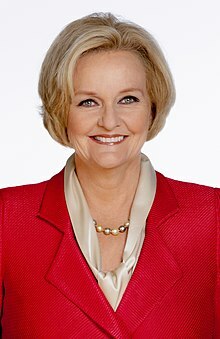 In January 2008, McCaskill endorsed then-Senator Barack Obama in his campaign for the Democratic nomination for president, making her one of the first Senators to do so. She was one of the most visible faces for his campaign, and her support was crucial to Obama's narrow victory in the Missouri primary in February 2008. She has credited her daughter Maddie as having persuaded her to publicly endorse Obama. She was frequently mentioned as a possible vice-presidential nominee for Obama, but was never seriously considered. 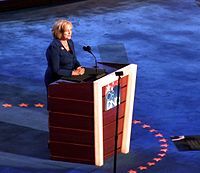 She spoke on the opening day of the Democratic National Convention in August 2008. In November 2017, President Trump visited Missouri to promote his tax bill and said that if McCaskill didn't support his tax plan, she should be voted out of office. She said that she could support a tax bill put together "in a bipartisan way" and that she would support "doubling the standard deduction," "enhancing the child tax credit," and even "some corporate tax relief as long as we were cleaning up some of the loopholes that allow so many corporations to avoid paying their fair share." But she did not support Trump's tax bill, which in Missouri, she said, would mainly help rich St. Louis suburbanites. She co-sponsored the Saving Federal Dollars Through Better Use of Government Purchase and Travel Cards Act, which sought to improve the processes related to the use of credit cards by government employees. ^ "Claire McCaskill's House in Kirkwood, MO (Google Maps)". Virtual Globetrotting. November 29, 2007. Retrieved November 9, 2018.